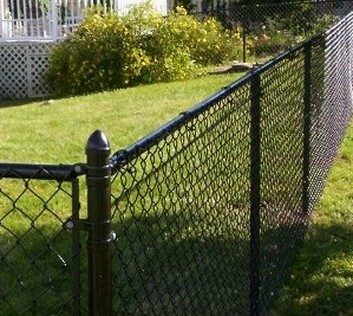 Quality fence products and the service you deserve! Ornamental aluminum pool fence – As you begin shopping for aluminum pool fence, you may notice similarities in products from manufacturer to manufacturer. 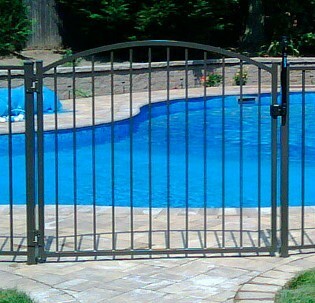 All of the major pool fence brands use nearly identical components. Rail widths, wall thickness and even styles vary little from brand to brand and very often price is the deciding factor. 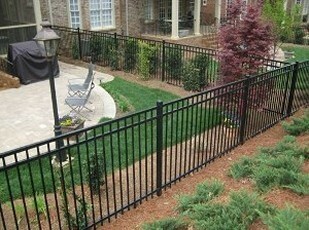 We proudly feature OnGuard Fence Systems™ pool fence products at the lowest prices. A photo illustrated step by step PDF do-it-yourself aluminum pool fence installation guide is included with every purchase. For further do-it-yourself assistance, a trained installer is available by phone for immediate friendly advice and tips on proper installation techniques, function and appearance for a secure pool fence that will meet the BOCA pool barrier safety standards as required by code. Give a call or send an e-mail to profencesupply@gmail.com for our pool fence products specifications, a price quote or to request a brochure. For those considering a professional installation, an on site consultation is offered by appointment. Eastern Ornamental aluminum pool fence products feature hidden picket screws. Within the delivery area, Eastern pool fence is delivered free on Long Island, Kings, Queens, Bronx, Richmond Counties, the Hudson Valley Region of New York, all of New Jersey, Connecticut, and parts of southwestern Massachuetts. Eastern Ornamental aluminum is available in an Indusrtial grade which uses one inch square pickets. PVC/Vinyl – why Illusions™ fence products are better: Some big box home improvement stores sell vinyl fence sections that WILL NOT LAST in many climate zones. Whether its heat or cold, PVC/vinyl moves with thermal variations! Take a look at any house with vinyl siding. If you examine the area of the ‘seams’ you will notice there is actually an overlap of about 3 inches. When properly installed, this allows for expansion and contraction. Fence panels that are attached to posts with rigid fasteners will eventually fail. In the cold of winter, when the vinyl is most constricted it becomes brittle and a gust of wind can cause fracture of the vinyl fence at the bracket or destruction of the PVC at the screw. Heat causes panels to expand and buckle placing unnecessary stress on the mounting hardware that leads to premature weakening of the PVC. These problems are especially common in vinyl fence products using recycled plastics or fillers. Additionally, pre-formed one piece vinyl fence panels or vinyl fence sections assembled with individual components that are glued (‘fused’) together will not rack (move from side to side) the way Illusions™ fence products will. When installed on even the slightest grade, there will be a void between the bottom of this type of vinyl fence and the ground on the downhill side. This is often referred to as a ‘step’ installation and can present problems if you want to keep the dogs in or critters out. Illusions™ vinyl fence posts are routed to accept panel rails and allow for expansion and contraction while giving enough flexibility to eliminate the ‘void’. We are a factory authorized Illusions™ Vinyl Fence products dealer and the extensive line of professional grade, no maintenance Illusions™ vinyl fence products and repair or replacement parts are available for fast delivery. 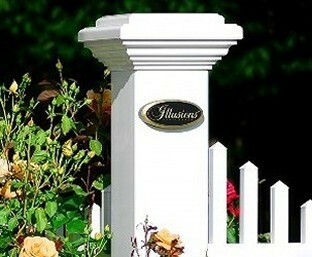 Contact us to request an Illusions™ fence brochure or for a price quote. 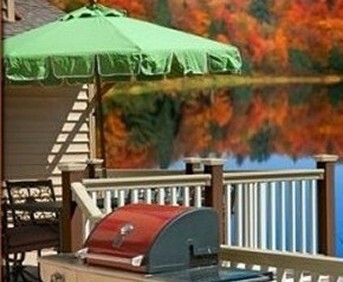 Our fully assembled Illusions™ vinyl fence is delivered free in the Hudson Valley, New Jersey and Connecticut. Better prices, better materials, better service. Illusions™ Vinyl Fence products are only available through an authorized Illusions™ Vinyl Fence dealer! Color Vinyl Fence by Grand Illusions™ is a brand new product that is sure to revolutionize the Vinyl Fence Industry! A low gloss, matte finish vinyl fence that offers the flexibility to Mix ‘n’ Match thirty five colors or custom match an existing color! Even Black vinyl fence can be manufactured in any of the Illusions vinyl fence styles. The Grand Illusions™ Vinyl Fence series provides even more selection with Grand Illusions™ Woodbond that can be mixed and matched with any color to create the fence of your dreams. Nobody offers you more fence color options than Grand Illusions™Certified by an independent third party for your assurance of quality and longevity!! Vinyl Woodbond is the perfect soloution for those who want the warm, rich feeling of some of the worlds most exotic woods without the hassle of traditional wood maintenance requirements. Grand Illusions Vinyl™ Woodbond vinyl fence products and deck railings are shipped fully assembled, individually wrapped and ready for installation. Available in five of the most desireable fence woodgrains; Mahogany, Cherry, Walnut, Rosewood and Eastern White Cedar. Imagine, the ease of no maintence vinyl and the completely lifelike detail of real wood! 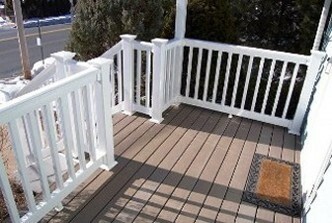 Vinyl porch and deck railing – We carry the safest, highest quality, code approved vinyl deck railings available anywhere! Illusions™ Vinyl Deck Railing is ICC-ES AC174 Certified SAFE. Delivery for the do-it-yourself installation, to the contractor, or we can suggest a local professional vinyl railing installer! We answer the questions that leave the guys at the home improvement stores scratching their heads! Nobody provides you with better service than profencesupply.com. Nobody. Color Vinyl Deck Rail Systems by Grand Illusions. Another brand new product from the makers of Illusions vinyl fence products. With the ability to custom match any color or select any of the thirty five principal colors to Mix ‘n’ Match, the choices are almost endless! There are also four completely lifelike woodgrain finishes in the Grand Illusions Vinyl WoodBond Vinyl Deck Rail Series. All with the safety of an ICC-ES rating and backed by the ASTM testing that assures a smart investment. Chain Link fence products — Delivered in Orange, Ulster, Sullivan Counties, and throughout New Jersey and Connecticut our System21™ powder coated chain link frame products are hand selected to assure you the highest quality. We handle all types of chain link fittings in all sizes, chain link gates, galvanized and vinyl coated Marine Link™ chain link ‘mesh’ (fabric) in all heights as well as chain link fence privacy slats. We will gladly put together a materials list for the do-it yourself installer at no charge. Pool Barrier code compliant vinyl coated chain link for pool fence is available too. 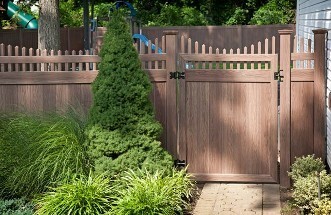 White Cedar fence products – Even with today’s synthetic materials wood is still a popular choice. Naturally resistant to insects and decay nothing matches the beauty of Cedar. If you’re looking for privacy, semi privacy shadow box (board on board), custom arbors an pergolas or stockade and post and rail/split rail fence, these wood fence products are the finest available anywhere in the Hudson Valley! We can also custom make to fit your specific needs! 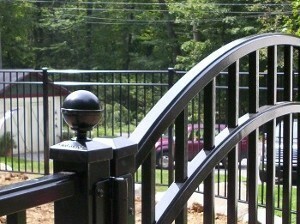 Guard rail – is available from profencesupply.com. 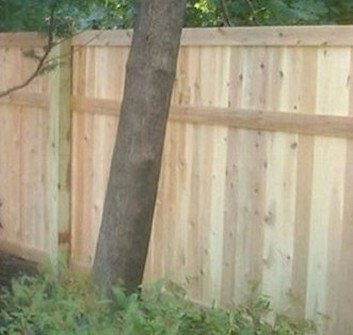 We offer wooden barriers that are installed using an 8x8 post and a 4x8 rail. Galvanized steel box rail, cable and wood backed steel systems are also available. 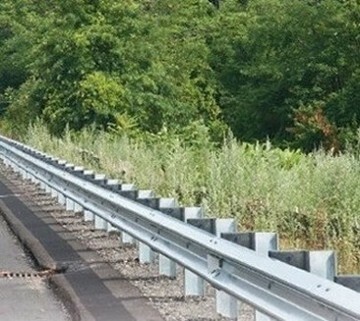 Our selection allows you to choose the guard rail that’s right for your project. Style and functionality come together with yard accents from Mayne. 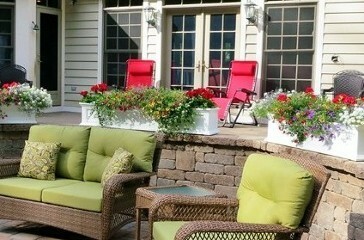 Create an elegant addition to any deck, patio or window. Fresh design ideas provide a great finishing touch to your outdoor living space. Beautiful and durable, the Mayne selection of planters, window boxes, mail and lamp posts will endure the seasons providing you with the long lasting quality for a true dollar value. 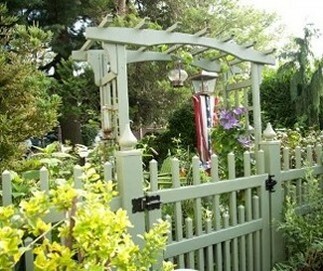 We offer a 15% discount on all of the beautiful Mayne Outdoor Products with any fence purchase! 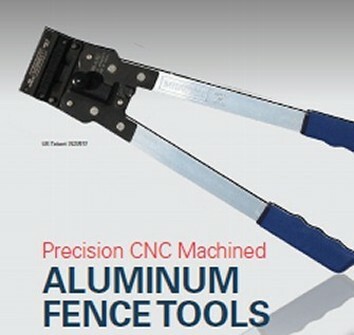 Professional fence installation tools – Designed to make the installation of aluminum pool fence and all styles of vinyl fences easy and with professional results. From post hole diggers and digging bars to specialized tools, we can help you find what you need. These tools are Made In The U.S.A.!